The anniversary of the death of Aethelflaed (also known by the Victorian spelling of Ethelfleda) will be marked throughout the year in Tamworth with a number of major events, including the unveiling of a new six-metre statue, the creation of the town’s biggest ever piece of community art, a major commemorative church service, talks, a special guided walk, commemorative ale and an academic conference weekend drawing academics and delegates from all over the world. The Tamworth Lecture – Tamworth & District Civic Society’s annual Tamworth Lecture was given by historian and broadcaster Michael Wood on the subject of Aethelflaed. This was held at St Editha’s Church on Thursday, July 12. Tamworth Literary Festival Martin Carver talk - Tamworth Literary Festival welcomed archaeologist, writer and broadcaster Martin Carver to the Globe Inn on the evening of Friday, July 13. His talk documented the excavation of the fort built by Aethelflaed in Stafford. Tamworth Literary Festival panel talk - Organisers of Tamworth Literary Festival also planned a special talk which will saw a panel of female historians and authors discussing Aethelflaed as a woman and an Anglo-Saxon. This took place on Saturday, July 14. The panel was chaired by Dr Sara Read, together with Dr Jennifer Evans, Annie Whitehead and Marianne Whiting. Mercian Mosaic unveiling – A huge and ambitious community arts project, involving hundreds of Tamworth residents, saw 1,400 individual yard square tiles being brought together to form one stunning mosaic. The pieces were laid out on the lower lawn of Tamworth Castle Grounds for one day only at a grand reveal on Saturday, July 14. Learn more about the Mercian Mosaic. Aethelflaed Family Festival – A range of Anglo-Saxon themed events were planned to coincide with the Mercian Mosaic unveiling in the Castle Grounds on Saturday, July 14. These included an Anglo-Saxon encampment and a range of fun themed activities for all the family. 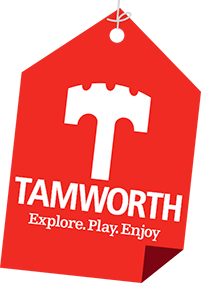 Saxon Living History - Find out what life was like for those living in Tamworth during Saxon times at Tamworth Castle, 14 & 15 July. Founder, Fighter, Saxon Queen: Aethelflaed, Lady of the Mercians FREE talks - Dr Margaret Jones was in Tamworth Library to discuss her new book as well as giving two FREE talks focusing on Aethelflaed’s contribution to the founding and growth of Tamworth. Coloured slides helped illustrate the wealth of sculpture,stained glass and painting associated with her legend. A special Tamworth Anglo-Saxon history display - Tamworth Library hosted a special Tamworth Anglo-Saxon display including a 1913 Tamworth Herald report of the unveiling of the original Aethelflaed statue by the castle. Also on view was Mal Dewhirst’s poem,‘Manifesto Tamworth’ which is about Aethelflaed. Academic conference - Scholars from UK and international universities descended upon the town for a special weekend conference with a packed programme of lectures inspired by Aethelflaed. The event, on July 13 to July 15, explored themes such as women and political power in early Medieval Britain, the origins of St Editha’s Church, the uncontested succession of Aethelflaed’s daughter as an exceptional example of female succession, and Tamworth in the Domesday book. Delegates came from the United States, Canada and Europe. The conference was being co-ordinated by scholars from Keele, Chester and Manchester universities. View the conference programme. Guided walks - Tamworth Guild of Town Guides prepared a special guided walk this summer which focused on the town’s Anglo-Saxon and Norman heritage. Aethelflaed Ale - Tamworth Brewing Co in Market Street revived their award-winning Aethelflaed Ale to accompany the many celebrations taking place in the coming months. There was an Aethel AleFest on 14 July. New statue - Another key event in the celebrations of Aethelflaed’s life is the much-anticipated unveiling of the new six-metre tall statue of the Anglo-Saxon legend which has been construct by artist and sculptor Luke Perry. Lady Aethelflaed is now installed on the roundabout outside Tamworth Railway Station. Read more here. Church service - The Tamworth and District Civic Society organised a major commemorative service at St Editha’s Church to mark the actual anniversary of Aethelflaed’s death on June 12. Around 500 guests were invited from across the country including eight Bishops, well-known TV personalities, historians, authors, civic dignitaries from Aethelflaed’s fortified Mercian towns and a Danish Ambassador. Read more here. 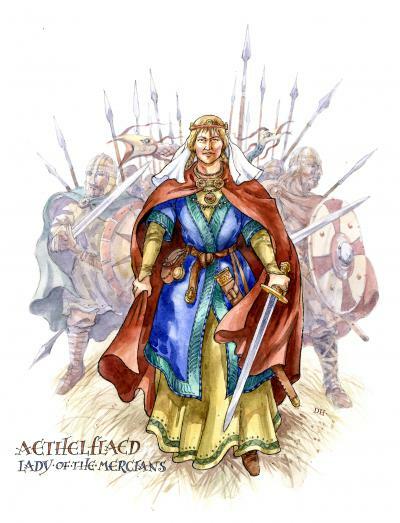 Here's a helpful video guide so that you can quickly learn about who Aethelflaed was. Join in now! - we’re asking people to join a social media campaign and #DoTheAethel!